I'll be there, right by his side, to nurture him, love him, to help him to... kill everything. You know, like a mother should. Dagon is a Prince of Hell, one of the oldest of the old demons, created by Lucifer himself after the creation of Lilith and before the sinking of Atlantis. Created to lead the demonic army against the forces of Heaven, at some point in time Dagon and her siblings Asmodeus and Ramiel abdicated their rank in Hell and took to living quiet lives on Earth with the demon hierarchy spreading the rumor that the Princes of Hell were all killed off to keep anyone from searching for them. Dagon has yellow irises, no visible pupils, and white sclerae. Ramiel states that after they left Hell, she occupied herself with "her toys," though it is left unclear what he was referring to. According to Castiel, Dagon is known mostly for her penchant for psychotic savagery. Although Dagon lacks Azazel's religious devotion and faith in Lucifer, she begins working for Lucifer again after he promises that she may rule alongside him and teach his Nephilim son. It is inferred by Dagon that being in Lucifer's favor gave her the ability to kill angels, humans and demons with a touch. Like Azazel before her, Dagon's presence causes lightning storms. Possession - Like most demons she requires a meatsuit to walk the earth. Smiting - She can smite angels at the sub-atomic level, a rare feat for a demon. When Kelly Kline is cornered by two angels in an alley preparing to kill her and her unborn child, Dagon suddenly appears and tells the angels to get away from her. The male angel advances on Dagon, who stops him from stabbing her and swiftly kills him by exploding him into dust. The female angel attempts to move on Kelly, but is stopped when Dagon teleports to her and explodes her into dust as well. Afterwards she tells a shocked and rattled Kelly to come with her if she wants to live. The next day, in a warehouse, Dagon explains to a still shocked Kelly that she is a demon and those were angels that were attempting to kill her. She also explains that Lucifer was an archangel and God's favorite, and that no one is born evil. She tells her that her child could grow up and save everyone. Castiel goes on an interview with Herb Nelson, a conspiracy theorist who believes in reptilians and the utilization of pre-1996 technology and who owns the diner near where the two angels had been killed by Dagon. He shows Castiel footage of Kelly Kline hiding from a pair of angels and Dagon appearing and preparing to attack before the camera got fried. They both notice her yellow eyes flashing before she attacks, which Herb attributes to her being a reptilian. Later, Castiel informs Sam and Dean of Kelly's previous location in Coeur d'Alene, Idaho, and her newfound guardian in Dagon. He tells them that he's only heard stories and rumors about her, most notably the rumor of her penchant for psychotic savagery. As Dagon is preparing a sandwich for Kelly, Lucifer reaches out to her to confirm that Kelly and his son are being well protected; he tells Dagon not to fail him again. When Kelly begins getting strange pains, she demands Dagon to take her to see a doctor. While getting a sonogram, the doctor appears to notice something strange, but is psychically compelled by Dagon to tell Kelly that "everything looks a-okay." Later, while Dagon is out getting supplies for Kelly, Kelly is found and taken by Dean Winchester who takes her to meet with Sam, Eileen Leahy, Mick Davies, and Renny Rawlings. Soon after arriving, a sudden lightning storm occurs, and Dagon appears out of thin air and sends everyone flying with telekinesis. As Dagon begins advancing on Kelly, Dean and Mick attempt to slow her down by shooting her, to no avail. She grabs Kelly and begins walking away. When Eileen grabs the Colt and fires it, Dagon disappears along with Kelly, causing the bullet to miss her and hit Renny in the chest, killing him. Back at a safe house, Dagon handcuffs Kelly to the bed, telling her she can't be trusted. When Kelly tries to explain she was worried for the health of her child. Dagon tells her she doesn't need to worry, as the baby is strong and will be fine no matter what, but she will not. She tells Kelly that birthing a Nephilim is always fatal for the mother. Dagon is immolated by the combined power of Castiel and Kelly Kline's Nephilim child, Jack. Kelly is seen in the basement of the safe house refusing to take care of herself, to the point where Dagon has to force her pills into Kelly's mouth. Dagon tells her what she will do with the baby before she unchains her and tells her to take a bath. Kelly tries to kill herself by cutting her wrists, but the Nephilim is able to keep her alive. After Dagon discovers what happened, Kelly tells her that her baby is not evil, but Dagon replies that the baby saved her to save himself and that the outcome where he will be born and she will die hasn't changed. After Joshua tracks Dagon down, Castiel, Kelvin, and Hozai infiltrate the house to retrieve Kelly and her baby. Castiel is able to escape with Kelly while Kelvin is captured by Dagon and Hozai is killed. Lucifer calls her to check in on his son, but Dagon has to tell him what happened, which infuriates him. She is forced to kneel in pain from his enraged scream. Lucifer promises to make her suffer if she fails to locate and retrieve Kelly. She promises to find them and goes on to torture Kelvin to find Castiel and Kelly; he points her to Heaven's Gate right before she kills him. Castiel and Kelly reach the gate before Joshua. When Joshua arrives, Dagon materializes behind him and kills him. While she attacks Castiel, Sam and Dean try to buy them time to escape but she is able to overpower them, taking the Colt and using her power to melt it in her hand, severely damaging the gun. 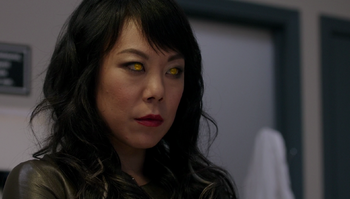 She goes to kill Castiel, but he takes Kelly's hand and is unknowingly imbued with the Nephilim's power and is able to block Dagon's attack, leaving her confused as to how he could have done that. Castiel responds with "call it a miracle" and grabs Dagon, causing her to spontaneously combust, killing her. When asked what he remembers, a confused Jack experiences a flashback of Dagon's death and states that he remembers "when the bad woman burned." Dagon, or Dagan, is a deity of Mesopotamian, Assyro-Babylonian, and Levantine origin and is described as the god of the Philistines in the Hebrew Bible. Dagon is also the name of a short story written by H.P. Lovecraft where he is depicted as the ancient Philistine Fish-God and one of the "Great Old Ones". This page was last edited on 3 November 2018, at 16:28.